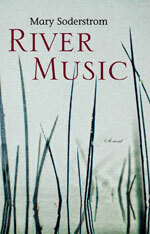 River Music, the sixth novel from Montréaler Mary Soderstrom, follows the life of Gloria, a pianist who struggles to make her way as a female musician in mid-20th-century Montréal. From early childhood, Gloria learns how the “river of music” can carry her away from a life fraught with troubles, but that same river will lead her to much struggle and even disappointment as she must fight for opportunities to realize her musical potential. While music remains important throughout Gloria’s life, its raw power increasingly takes a back seat to her career and her relationships : the lover who connects with her, the supporters who feel entitled to a piece of her, the daughter who dismisses her accomplishments. Gloria’s course reflects the enormous changes that were taking place in Montréal as it became a cultural centre and a bustling metropolis; her story illustrates the considerable challenges faced by musicians and by women in this time and place. While some might characterize her as cold, Gloria is a rare heroine (or perhaps antiheroine), unapologetic about her ambition and lack of sentimentality. Gloria shatters the myth of the “sensitive artist” to reveal the truth about the importance of hard work and especially sacrifice to artistic pursuits. The narrative’s pacing is languid – more adagio than allegro. Unfortunately, there are some gaps in an otherwise fascinating historical landscape. Nevertheless, I recommend River Music for anyone interested in Montréal, its history, and its musical culture in the twentieth century.